I made this specifically for someone who loves Owls. I hope she enjoys the whimsical feature of the shaker portion of the card. Oliver the Owl was colored with Copics. His glasses were stamped and sent through my Pixscan software so I could cut them out with my Silhouette. 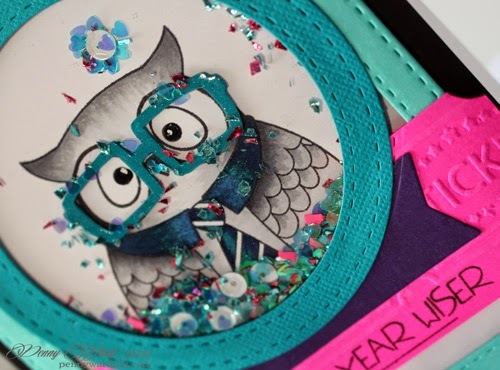 Lots of Stitched die cutting on this little cutie from Lil Inkers. His eyes and glasses have Pico Shimmer applied. Love that Owl shaker!! Great card! Penny - this is so amazingly cool and fascinatingly done!! I am thinking that your colors ramp up the intelligence factor of your owl!! The colors are cool, hip and trendy - I think!!! Love that you made this card into a shaker and love the dies that you used - I added them to my growing list for my birthday next month!! LOVE! Such a fun shaker card, love what you've done! Thanks so much for playing with us at SFYTT!